Watching now....looks like it is in the cathedral main and huge. Flames leaping out. This is terrible! Thanks for the heads up. I hope it's not intentional. Chase, you'll want to take a look at the tags on this post and edit before it disappears. Things can't be marked with two tags if one of them is Hot Topics. I am so sorry. What a terrible loss. I just hope it looks worse than it is. I think they're doing renovations but geeze, this looks catastrophic. Such a magnificent historical structure. The spire is totally destroyed. Now the mid section is totally ablaze......the fire teams can't reach the flames. Reports are the roof has collapsed. Very very sad!!! I’m going in a few short weeks. Very sad, sad I’ll miss seeing it. The large tower is fullly engulfed. I remember being in Paris in 2002 and seeing that tower from our hotel room. 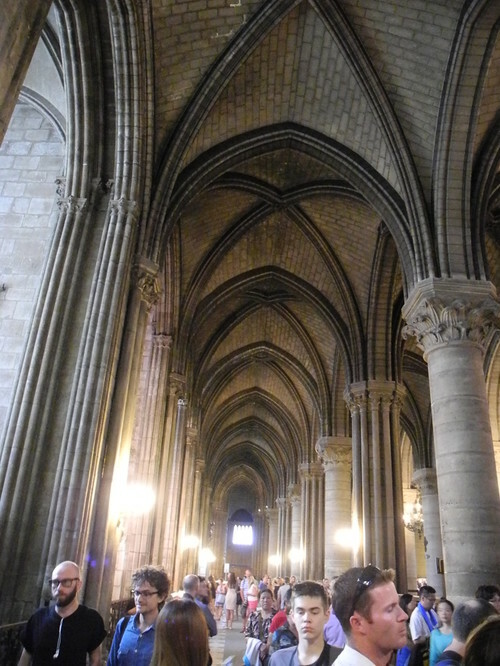 This cathedral is not only signficant in religious terms, but also in terms of architectural and historic significance as well. This is a real tragedy. The only word for this is anguish. It looks as bad as it sounds. What a tragedy. Pidge, I was there April, 2002. I was at Le Grand. This is heart breaking. 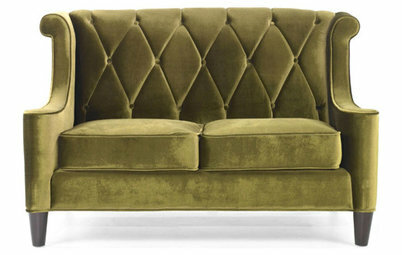 Like chase I think of the interior treasures. 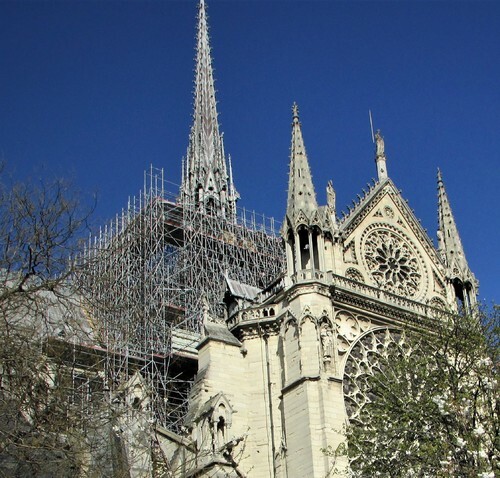 The spire is gone, the roof is gone...how apporaching the iconic front facade.......and on Easter Weekend, the most important of all Catholic feast days. Hope nothing happens to the Louvre. Think I’d go into deep depression . Its sad skipping around on the news and hearing the cracking voices and pain . Heartbreaking. It us unreal how fast it is being demolished. They had trouble getting in with equipment to stop the fire because the streets were to narrow. This is horrible. How tragic. Me too, chase. So sad. 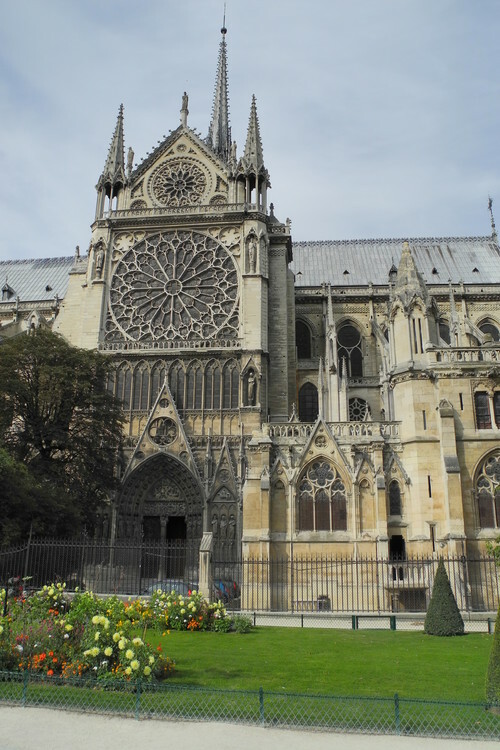 I'm not French, nor Roman Catholic, nor an architect, but I am an art historian, and my heart is breaking at the loss of all this building contains and means to so many. 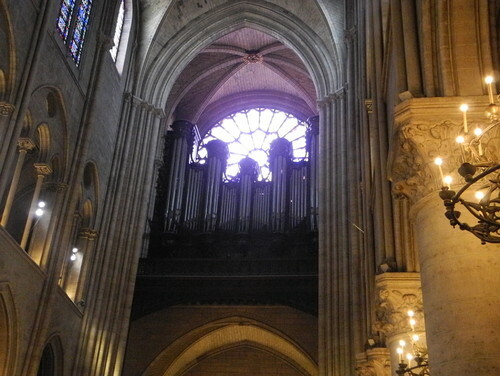 Art treasure over centuries, gorgeous stained glass, that amazing pipe organ... Almost too much to bear. 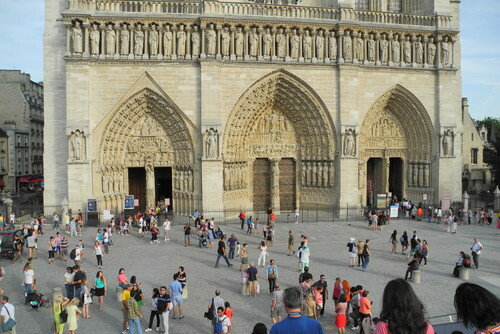 Notre Dame is my favorite place to visit in Paris. 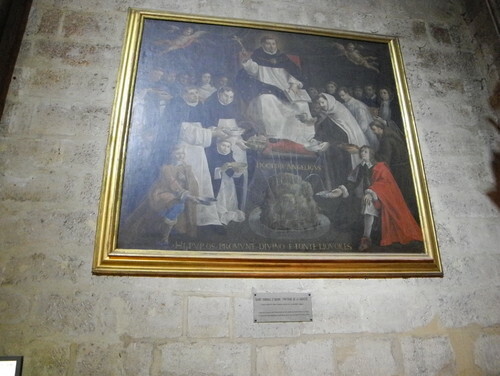 Especially the archaeological site under the church. 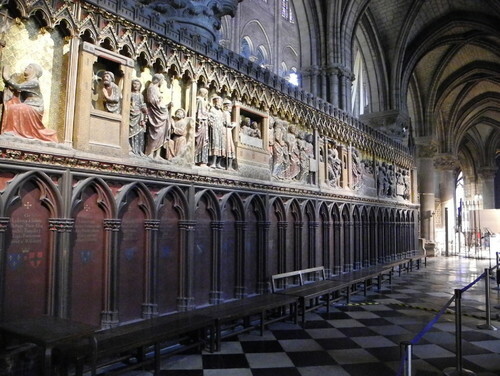 Priceless relics, artifacts and art. We Americans and so many around the world are reminded of watching our Twin Towers burn and be destroyed. It was unthinkable, surreal and horrifying. I really feel for the people of France. The gasps were heart wrenching. 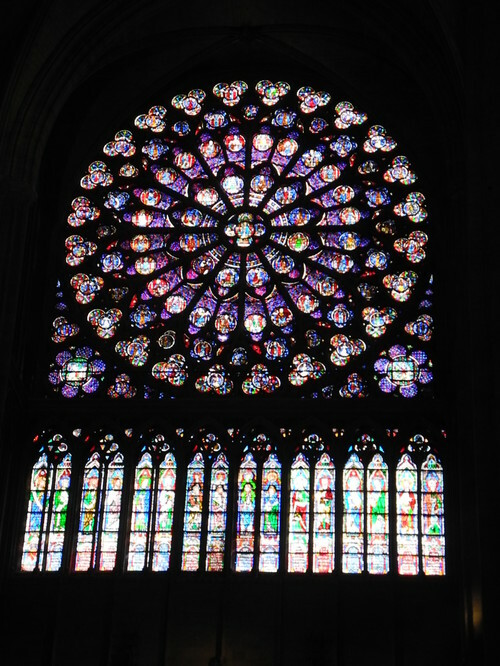 BBC is reporting that the stained glass windows have melted. What a crushing loss and tragedy, for France and for the entire world. It just seems unthinkable that this could happen. Tankers flying low over the city dropping chemicals? Early in our marriage my DH had to go on business to Paris. I went with him and enjoyed a few days on my own as he attended to business. I'm Catholic, my DH is an atheist. 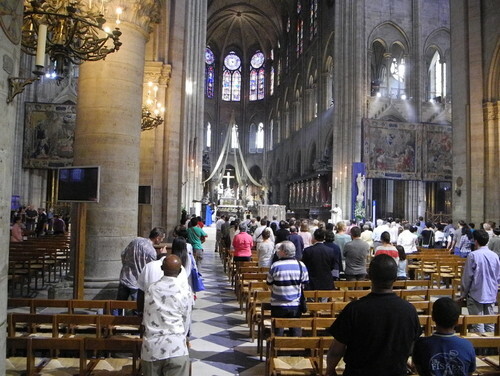 Although he loved the cathedral it's history and artifacts, attending Mass was not on his bucket list. So , one of those days on my own I attended Mass and lit candles for my Mom and Dad. It was very moving for me. That evening we had a wonderful dinner at a restaurant directly across from the cathedral , but on the bank. It was a lovely warm night, the magic of Paris, the beauty of the cathedral, the river in between ...an image and moment I'll never forget. 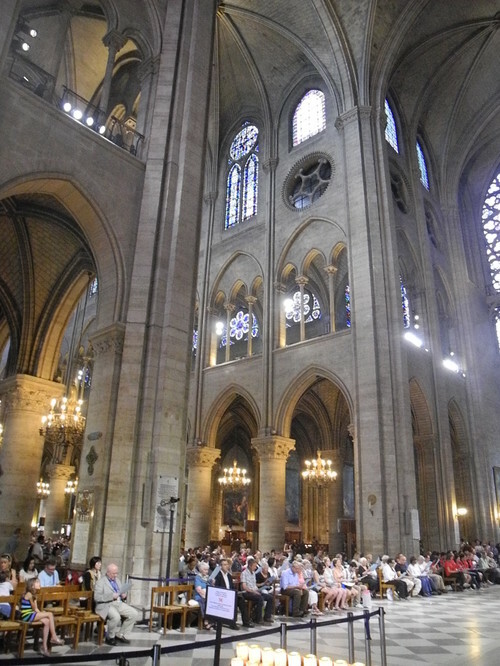 We have been to Paris several times since. 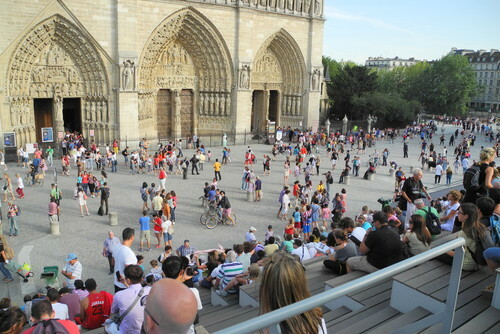 Can't imagine ever wanting to go back to Paris now. I had tears watching it fall. 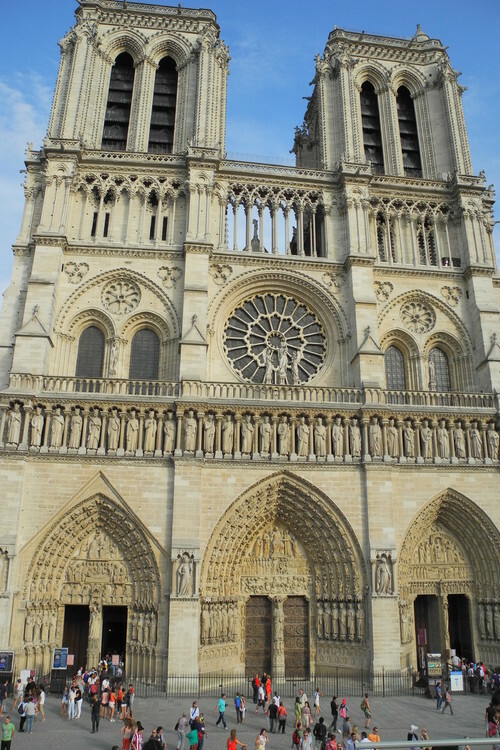 I've never been there but studied art history and this is one of the most iconic architecture in the world. It's beyond heartbreaking, beyond words. Just devastating...I can see no way they could ever rebuild...it took centuries in the first place, and not sure people even know all the construction techniques used to create that structure. 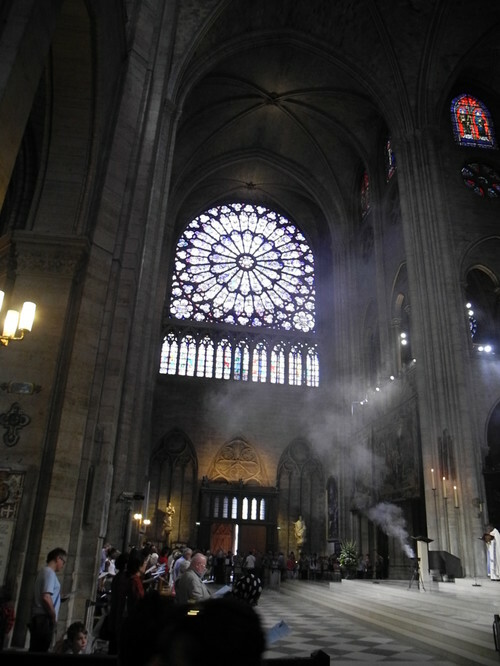 So far it looks like the rose window is still intact, but who knows if it's damaged. Just heart breaking. The front facade is still in tack....and the firefighters seem to be making some headway. I too wondered and heard a comment on tv about why helicopters were not called in to take water from the Seine and dump onto the building. Every area that has construction have work helicopters that could have helped with this fire. Would not have helped control it. When you think of how old and dry the wood was with all of the layers of paints it does make sense that the flames went quickly. I can't believe they just reported they just added a second hose. This size fire and only two hoses? Such a loss. Built in twelfth century. they're pretty much expecting a total loss. I don't get how it turned into the catastrophe it has. Couldn't it have been contained before it reached this level? 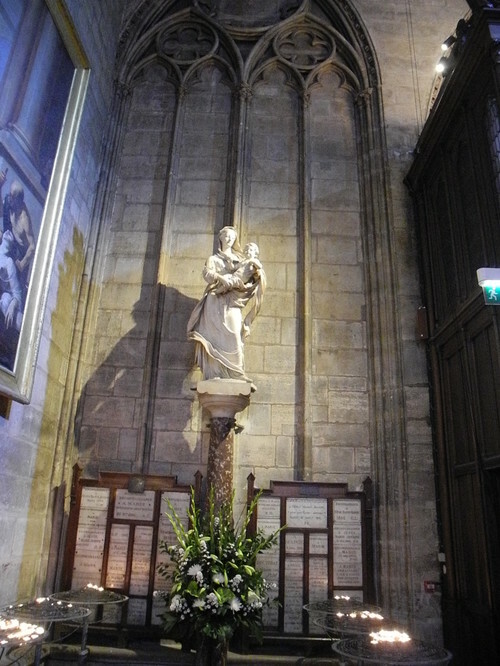 Breaks my heart and cannot imagine the sorrow the French people and Catholics are feeling on this Easter week. 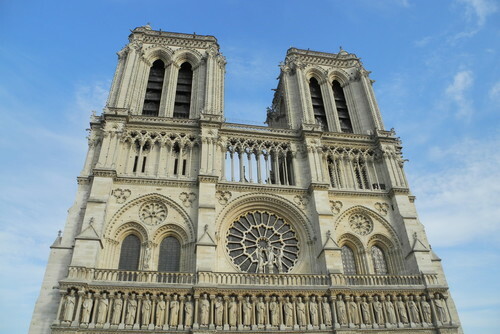 Imagine how long it took to build all those centuries ago and how long it will take to rebuild. Evidently the fire fighting helicopters could not fly over because of the heat thermals. Also the building is very , very high......getting the hoses to reach that high from the streets or river is not easy. So incredibly sad. 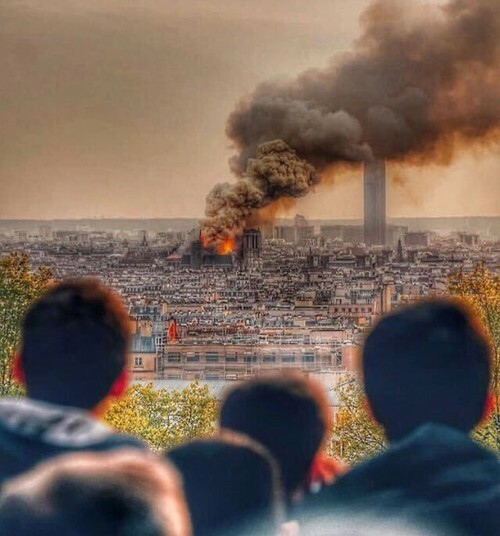 Macron said it best, A part of us burns with the cathedral. Fire fighting wise I would be hesitant to dump that kind of weight on stone lace. For the water to be useful you have to dump fairly low elsewise it turns into fog. Water is heavy. It could knock the walls out. Agree Patriciae, I'm sure there were multiple emergency contingency plans in place. These are things that are planned for and practiced all the time. I'm sure they knew exactly what they could do and what the constraints were. 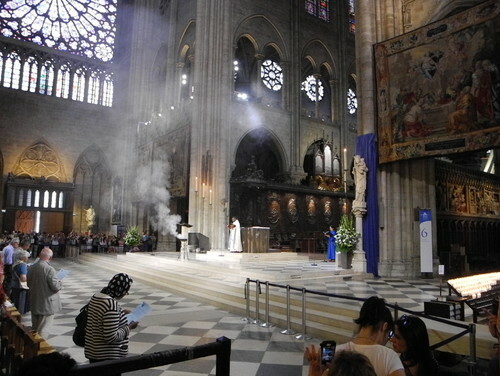 Oh I could not fathom how such a large fire occurred in that magnificient and historic treasure. Hope it was not intentional. Quel tragique! One of the front towers is on fire now. Air traffic is not allowed over the city center. I don't know if they have exceptions for fire fighting equipment from the air. They have that in the south, but not sure about near Paris. I too would worry about the weight of water crashing onto the structure. 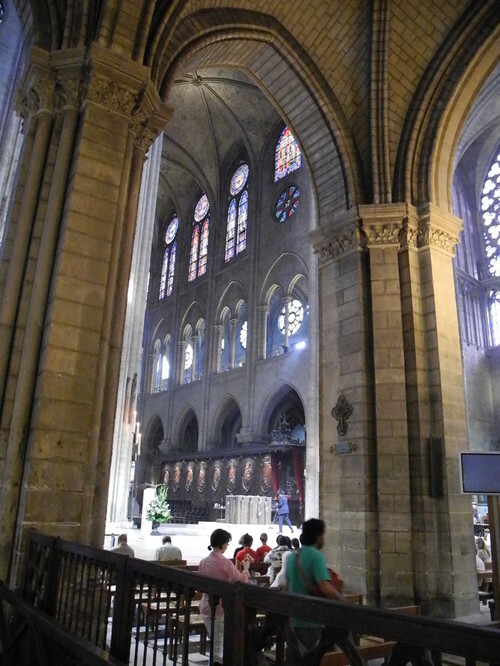 Right now I keep thinking that those flying buttresses counter weight that is mostly gone. I hope the walls don't fall. Yes, the walls. 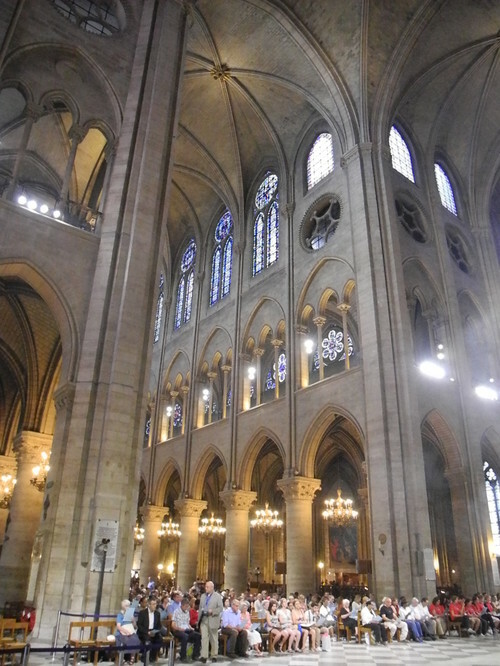 Cathedrals are like magic the way all the counter pressures keep them up. I am afraid they will end up with nothing but a pile of stone. 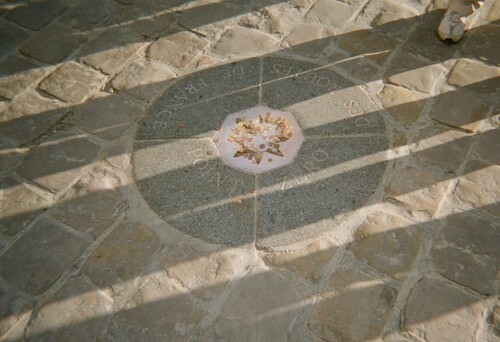 Point Zero, the spot from where all distances from Paris are measured. 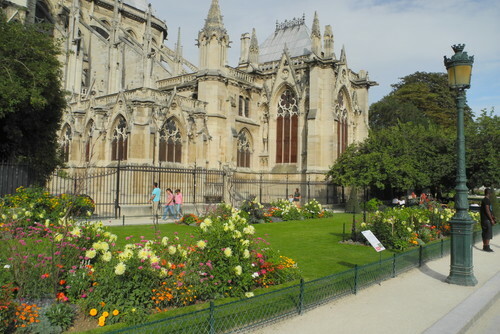 It is located in front of the cathedral...the heart of Paris. All those irreplaceable art pieces... very sad. 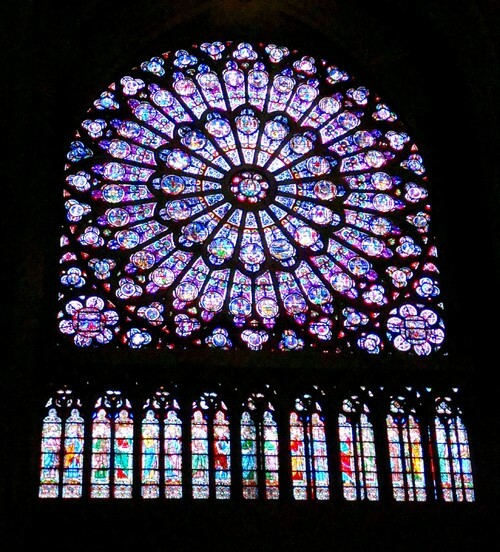 There was a priest on the radio saying how beautiful those windows are. He talked how you entered in a very dark area and proceeded further into the cathedral where it was very much brighter signifying coming from the darkness of sin into the light. Who would think that was intentional when it was built? The infrastructure of this place is beyond amazing and to think it was done those many centuries ago. 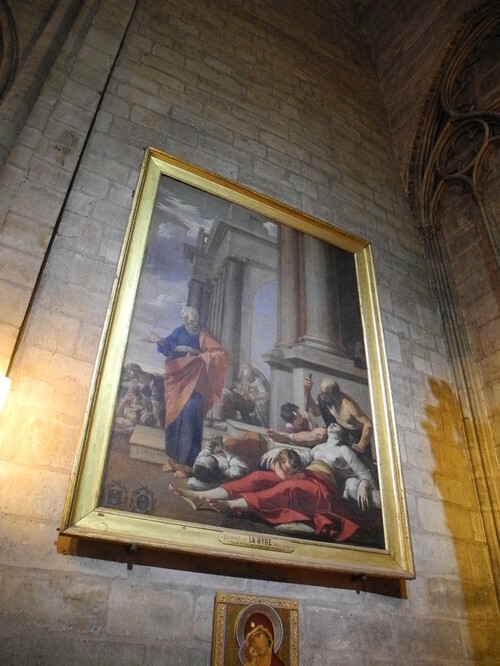 I hope some of the valuable artwork was removed before the fire and water damage. I would not like to be the person who inadvertently was responsible for this catastrophe. Just hope it doesn't collapse. From French authorities on Twitter: Le largage d'eau par avion sur ce type d'édifice pourrait en effet entraîner l'effondrement de l'intégralité de la structure. Which roughly translates to: Dropping water by plane on this type of edifice could begin the collapse of the integrity of the structure. This is a "where were you when..." event. The structure itself is still not understood by modern scientists. Such a devastating loss of history and culture. It makes me sad to think of what I've missed seeing in person. I am almost in tears, reading about this. We have been there many times and it never failed to move us. A reminder that nothing is forever. 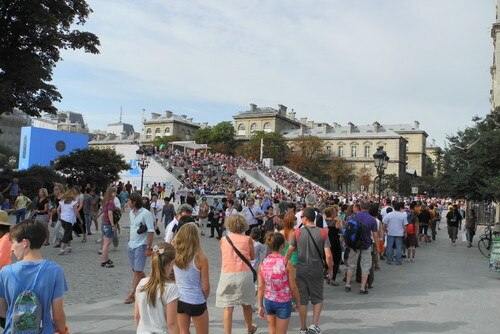 Those pictures are from my visit a few years ago. That's all that I'll post. I had a Nero Fiddling moment when I was watching one of the live feeds. 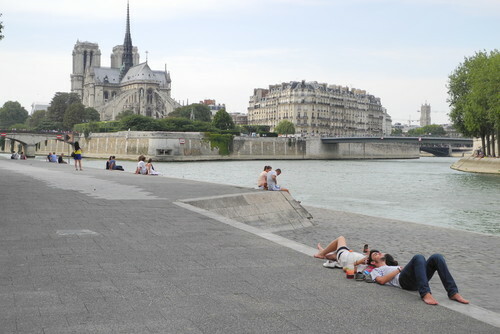 The perspective was from the other side of the Seine and they were not showing the Seine. 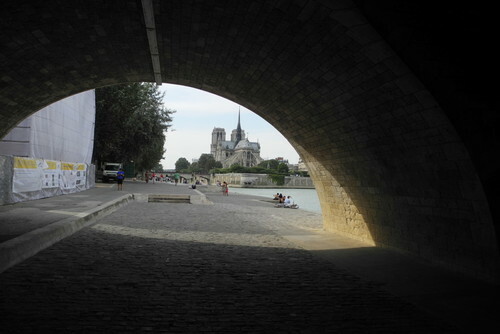 Just the view of Notre Dame above the Seine. But, then they moved the camera angle down to the river and there was one of those "dinner boat tours" and you could see the very properly dressed people enjoying their meals and their wine and with hardly any sense that I could see of the disaster surrounding them. Head French Prosecuter has started a criminal proceeding to investigate the fire. So they believe there may be criminality involved? Thanks for those pictures Hay, all of them iconic. I never visit any art museum without feeling just how vulnerable we are to great losses when we concentrate so much of our precious art in so small a space. And here we are. 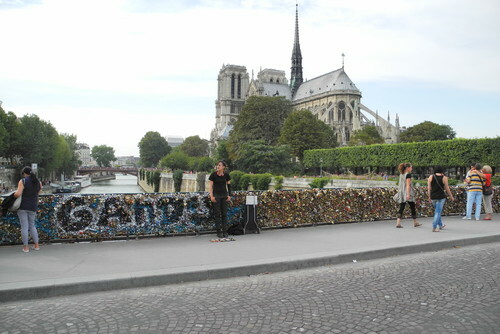 Paris was flooded in recent years and I remember the headlines that the Louvre was threatened with potential flooding. An accumulation of hundreds of years of the greatest artwork man has known and it's all sitting there waiting for disaster. I can hardly imagine it. 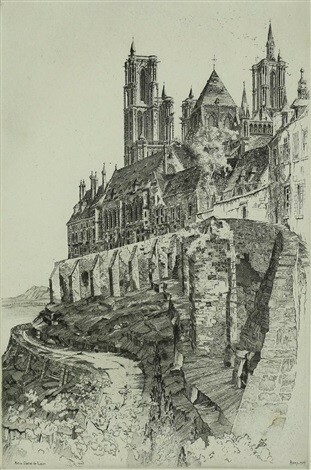 The Germans damaged some of the significant work of Monet in Paris during the war. Diversify. Don't put all your eggs in one basket. 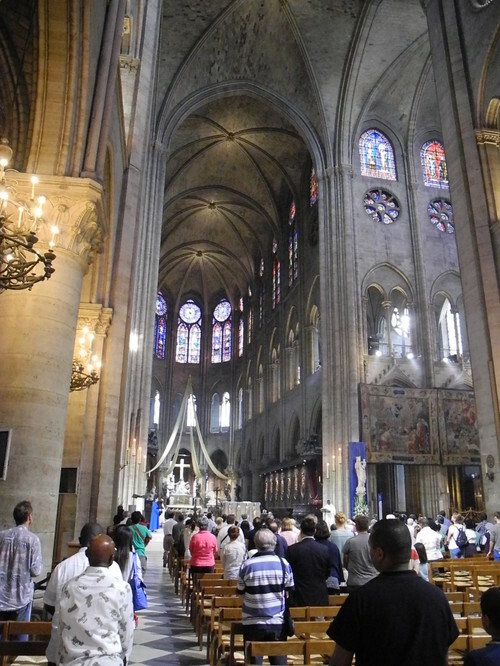 The interior (?) minister has said that it may not be possible to save the building. Hay, your interior shots are stunning. If you understand spoken French, Le Figaro has live coverage. Le Monde has frequent written updates. 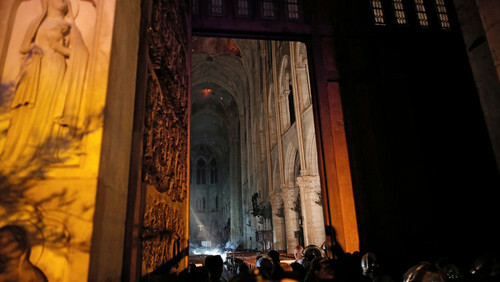 According to Le Monde, they cannot seem to contain the fire. The whole building will be gone soon with all its stained glass and artwork. What a tragedy. The BBC has live video and written coverage. I would expect that anytime a building of this calibre burns it would trigger an investigation. Of course. I don't think it means anyone suspects foul play, just that an investigation is the natural course of events. 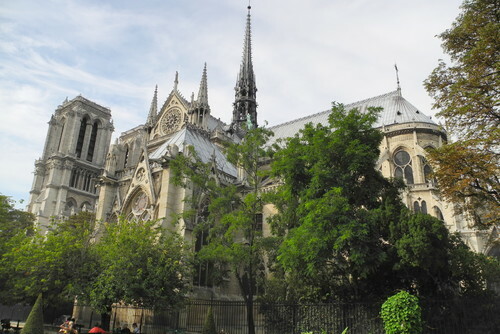 "The cause of the blaze was not known, but French media quoted the Paris fire brigade as saying the fire is "potentially linked" to a 6 million-euro ($6.8 million) renovation project on the church's spire and its 250 tons of lead. 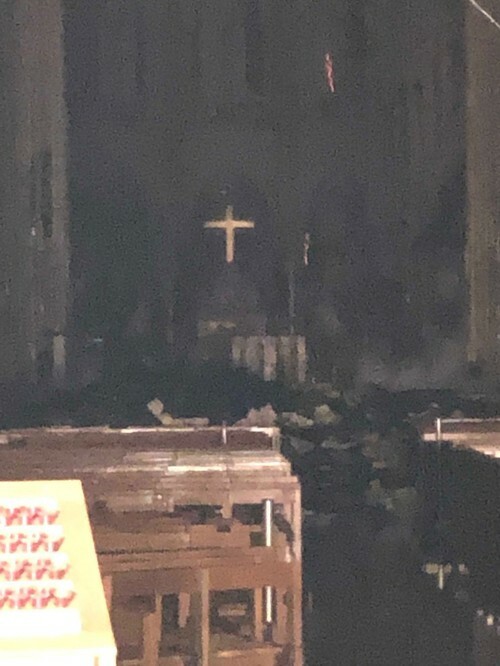 Prosecutors opened an investigation..."
This cathedral had been standing for centuries and now, for some reason, it's coming down. Humanity isn't taking very good care of our treasures. Just heart-wrenching. 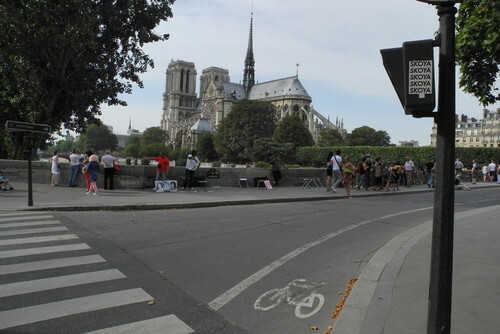 Paris, while I've only been there twice, is my favourite city. 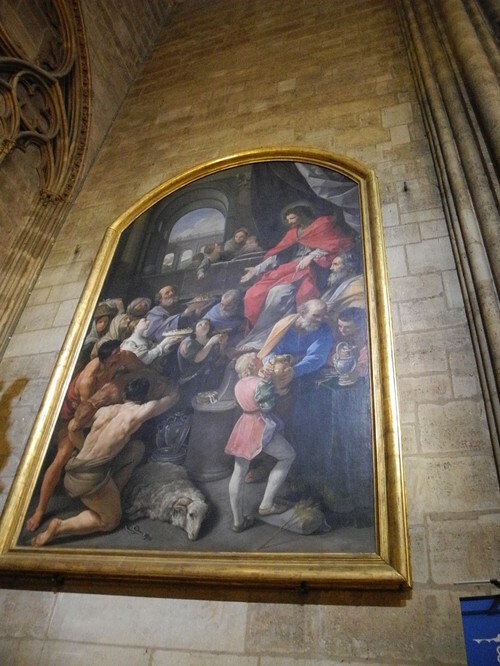 Just to walk the streets and pop into shops and churches and its art galleries. Paris will never be the same. Especially if the rose windows are lost. I guess the gargoyles are gone, too. I can't understand how it got this headway. 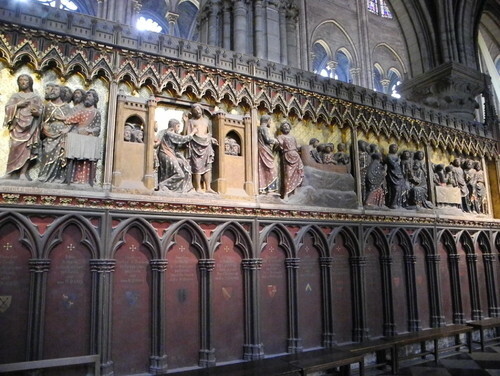 I realize the wood is centuries old and dried up and with the oils and paint but still? They say the next few hours will determine if it can at all be saved. I am so hopeful that something can be salvaged to be rebuilt but it will never ever be anything as it was. This is just too sad to contemplate. Now they are saying that the south bell tower is ok. Perhaps the walls will hold. 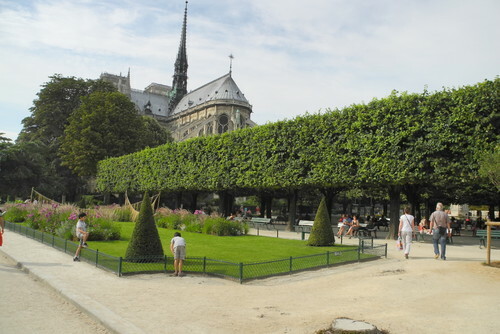 I too wonder what will happen if the flying buttresses give way. 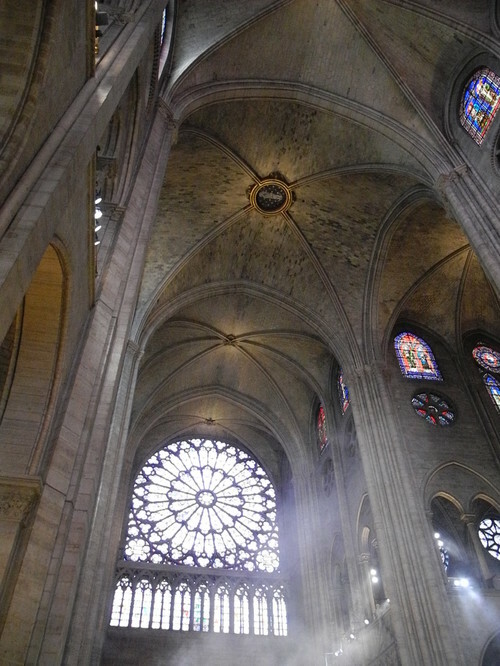 The rose window and its iconographic meaning -- destroyed by fire. 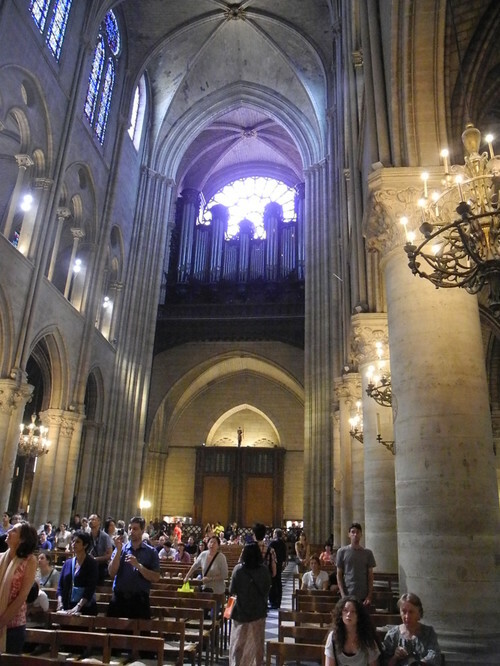 The very nature of a Gothic cathedral -- very high walls, high interior arches, large stained glass windows puncturing the walls -- makes it unwise to dump quantities of heavy substances on the structure. It is being announced that it looks like the stone walls have held. My biggest hope is that enough will be left of the church to make rebuilding it a viable option. Humanity isn't taking very good care of our treasures. The same could be said of our earth. Tragic loss and shame to be shared by the whole world. Just last week I read that the structure was so unsound that it would collapse without drastic help. There were quotes from five years ago saying there would be irremediable structural damage within...five years. There was pathetic response. 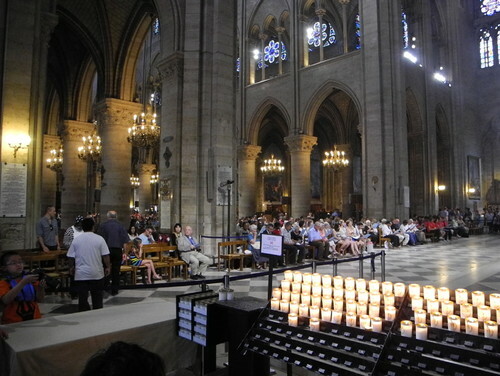 The French government has been contributing, however Notre Dame is not a national monument, but a functioning Catholic church. Now there is a project to unite our world, let's get together as we have over wars and rebuild that edifice as a universal gesture of faith in humankind. I would work for free. 10 years ago to the day, I was there. There are no words. It is interesting that we humans need to be connected with where we are from, it hits our very core to see this type of loss. I have never been there but this still fills me with dismay and sorrow. Started in 1163, what a loss. Great pictures hay. The reports I have been listening to say that it started in the attics, a place where you cannot go unless you are logged in and granted permission. My Mom sent me this today to show me what part was being worked on, she just got home Wednesday. Bookwoman, the picture of the altar is so devastating, but the cross is still there. It is beyond sad what has happened....a true tragedy of epic portion. I am so thankful it is under control and the walls and front facade have held. Hopefully the marble statues survived .......huge thanks, if the reporting is correct, to the the heroic firefighters who went in and took out as many paintings and artifacts as they could. Whew. Catkin I'm in tears. Thank you for posting that video. Do not celebrate too soon. Heat is hell on mortar. I sincerely hope that the walls and towers will survive but I will hold my breath until they do structural investigations. What is with that jerk of a President? Just when I can't think less of him he manages to lower himself even further. He is a total and complete embarrassment to the US. I don't get anyone who can defend his carp. Patriciae, the last thing I am doing is celebrating......there is nothing to celebrate........maybe some humble thanks for whatever may be saved or salvaged. It may not have been the brightest comment but I think the intentions were fine. My friend in Lyon wrote on her Facebook page about the Liar-In-Chief's ignorant tweet and the French response to it. FOAS, I know. ..It's just so trajic..so heartbreaking.. Sorry patriciae...didn't mean it personally . Um I meant Trump’s comment! The intention was to try and make himself look intelligent. It does the opposite and makes him look like the complete and utter moron he is. Add insensitive too. Really FOAS. ,? Was much happier when I thought you were giving me a well desreved shot about Patriciae' s post. 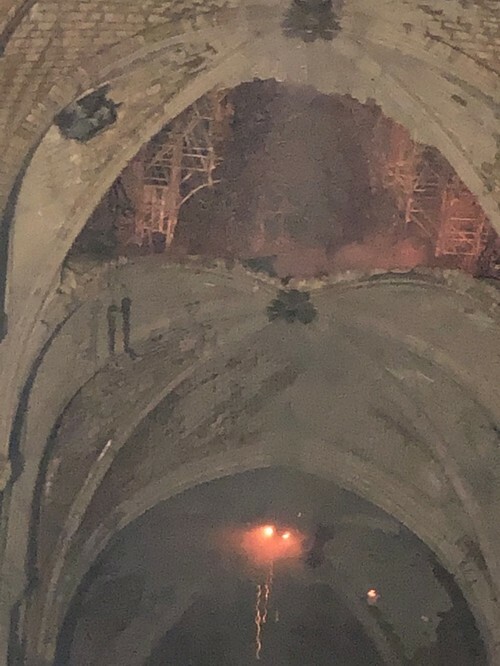 The first photos shown of the interior of Notre Dame cathedral after a massive fire broke out Monday seem to show the central part intact, with the roof and vault taking the worst of the damage. Edit: HG's link shows another 'after' picture that's more clear of the same view. Such a tragedy, no words just sadness and tears. 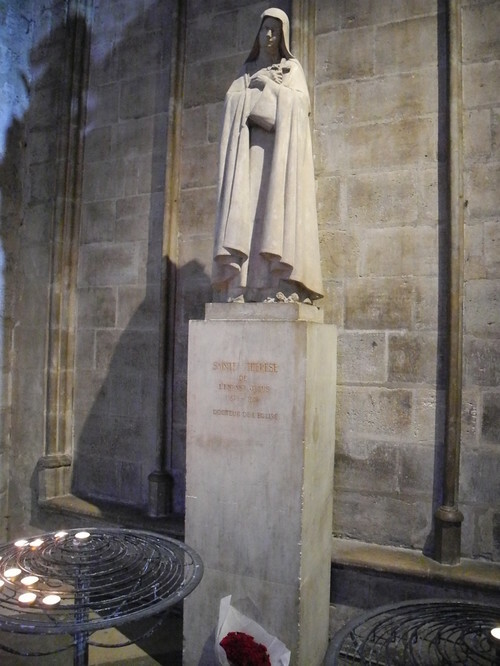 Thanks to Hay for posting and catkin for the video, French singing a soulful prayer. 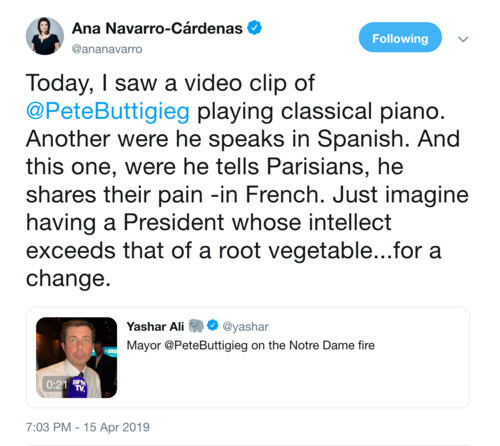 Pete’s compassion is evident and his French is very authentic, no English accent at all. Pete's accent isn't perfect, but he clearly speaks French very well. Hay, thanks for the corrected link. It worked when I first posted it, but not later. Chase, I understand entirely. I am with you on this. I am not Catholic of course but I can understand the heart break. this is a church. I lost a home, a Victorian to fire. It was struck by lightening and burnt so hot it melted all the immense windows. I salvaged the old brick by tearing down the five chimneys, piers and brick infill. You could pull the bricks out with your bare hands even though they looked perfectly solid. I learned what heat does to mortar the hard way. The extreme heat penetrated right into the bricks in the ground even though the house was several feet off the ground. Hays interior shot shows combustibles not burned. It gives me hope. 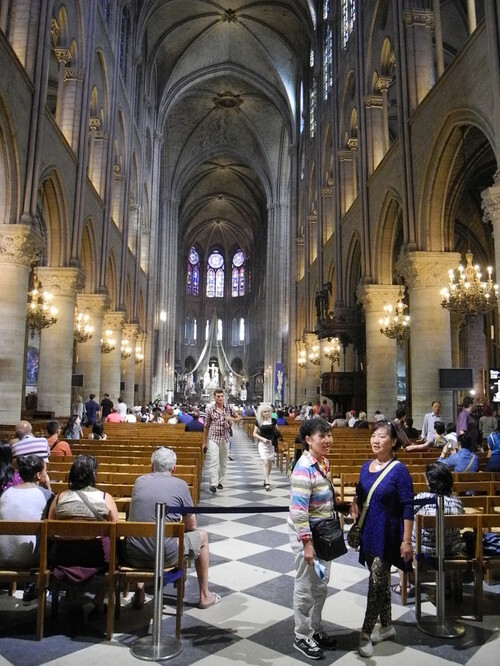 I have heard they were able to pull some of the treasures out and because of the renovation they had already moves some thing out. Lets celebrate that at least. 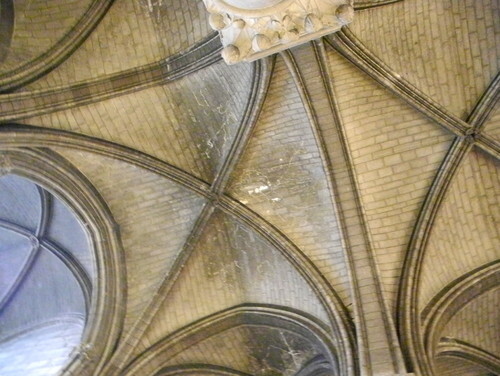 You can see the "before ceiling" in the photos I just posted.
" 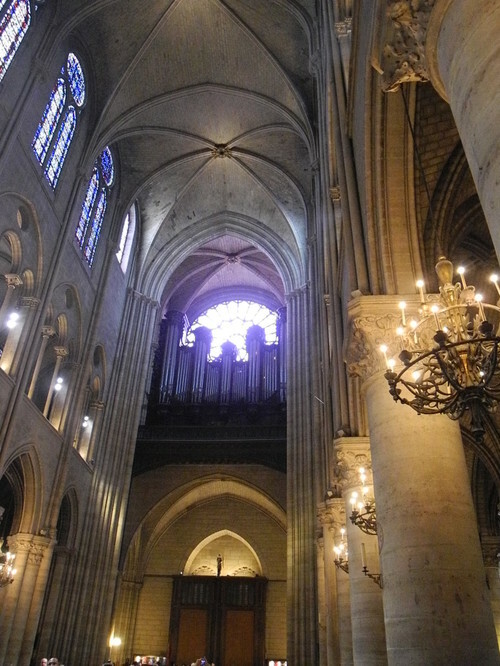 "Anne Hidalgo, coming out of the cathedral "there is a big hole, at the level of the roof, where the arrow was, now crumbling in the nave. 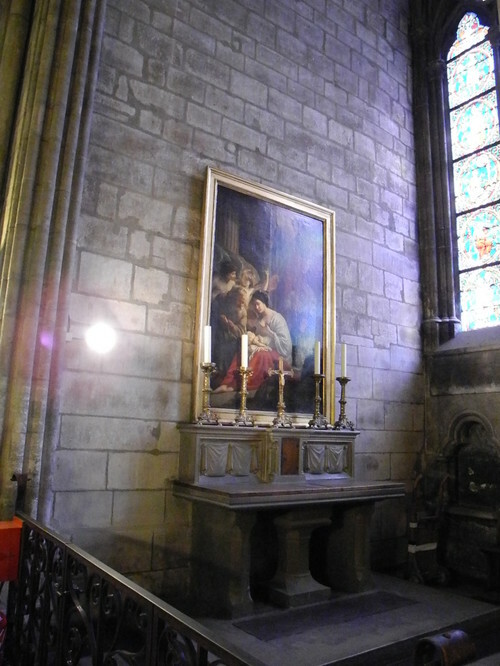 The altar and its cross are preserved. It's less terrible than I feared"
I have this picture that I must have taken straight up. I don't know exactly where it fits in, but it gives you a close up view of the ceiling. Hay, 'arrow' should be 'spire'. Great pictures. For a few minutes, I'll give you some more pictures from my visit. In the order I took them. I don't remember a lot of this, but this looks old wood to me. I don't know where it is, but back there somewhere. Wow, those photos of the interior that HG posted (I didn't see them before) are really encouraging. Means that part did not get the heat. survive and that emergency responders salvaged its most precious art. Much was lost but do not become too despondent over this. This iconic church will be rebuilt to its original glory and will be stronger and safer for generations to come. Thank you, Hay, for all the pictures. That beauty was beyond description. I'm mourning with all of you. The footage of the French singing is incredibly touching. Bart, I think two reasons have been given, the official one being that the weight of the water would put the entire structure in danger of collapse. The other I saw above had to do with the heat and turbulence above the fire being too great. That's correct Rina that's what I heard too. The experts were very concerned the weight of the water would collapse the stone walls and that would have been devastating. Not only would they lose the walls , but if they fell in it would destroy artifacts , if they fell out there would be much devastation to close by structures. The walls are huge !!! I also heard it reported that they had several developed and rehersed strategies for a tragedy like this....so they were " ready" . 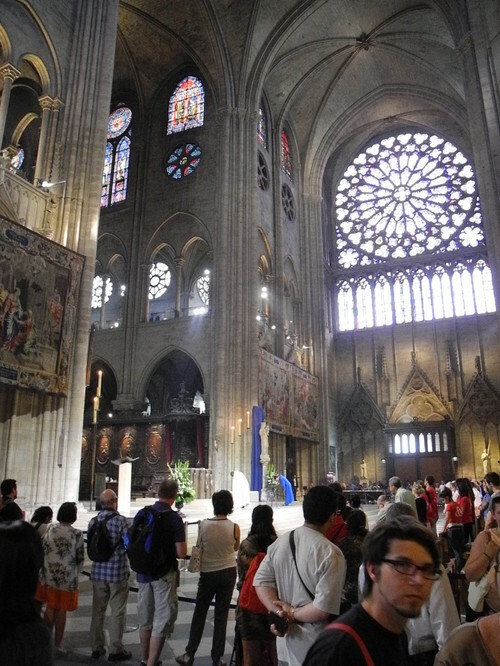 The facade, towers and rose window are all saved and the firefighters saved many of the cherished relics and art work......God bless everyone of them! 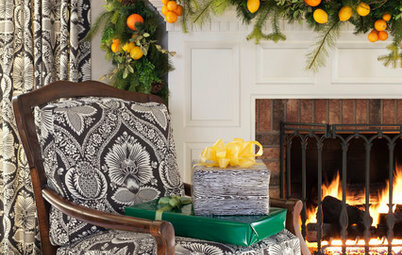 My thanks to Hay for sharing those photos. 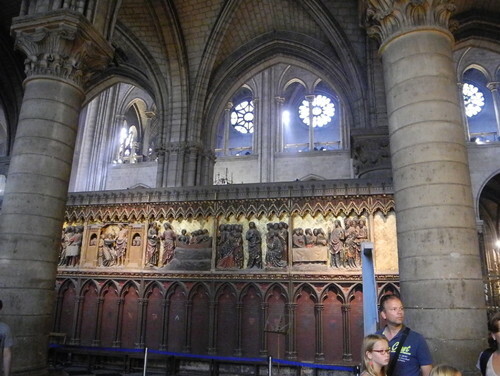 I don't think I took a single pic while I was there--just mesmerized by what I was seeing. So I am grateful for the reminder of the place's beauty and signficance. The pictures in this CNN link are devastating and encouraging at the same time. Much destroyed, but not as bad as I feared. From what I heard from a fire expert last night on NHPR , dropping water is only okay when you are willing to destroy any man made objects you drop it on. He basically said the water would crash through the floors. 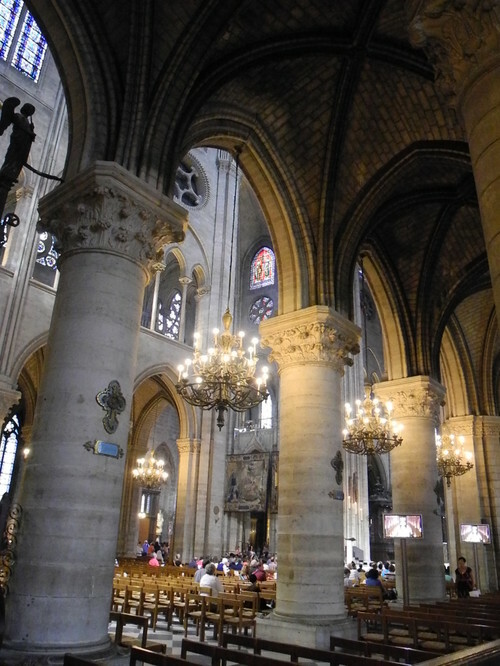 Having seen the interior shots it is now obvious why they were mostly spraying water on the outsides of the walls which seemed a strange thing to do but they knew the interior was mostly intact acting as a fire wall. 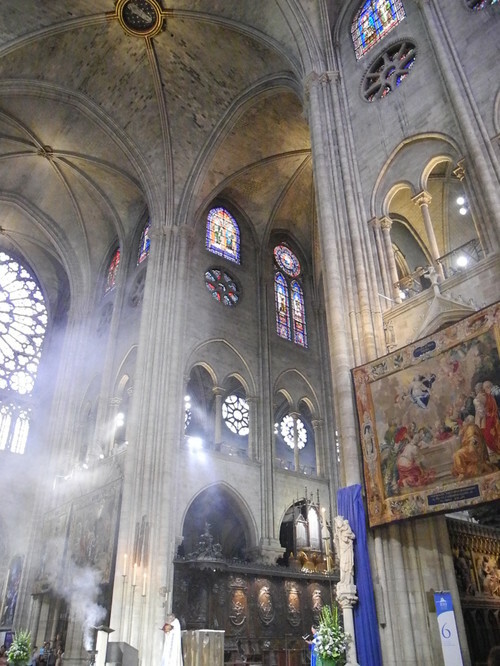 Once the flammable upper structure burned away, and there was no putting that out, they could salvage the rest. I have heard the structure is essentially sound. Such a relief. I did trust that they knew what they were doing but would that help? I know what your mean, Patriciae. 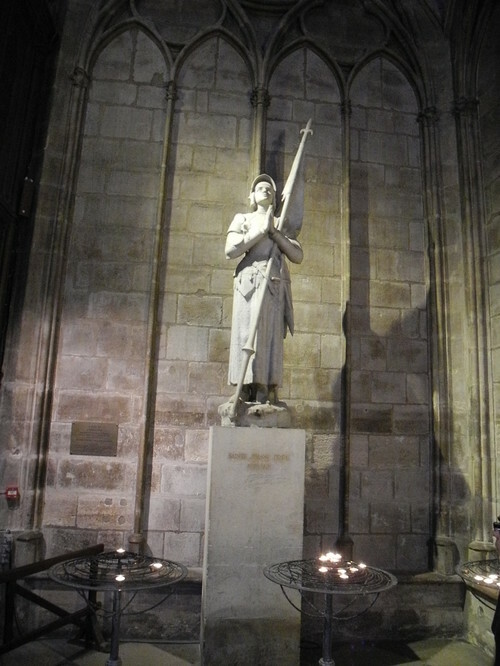 But I knew the French could be trusted to be as skilled as anybody in matters of this sort -- and most other matters, too. I had no fear at all that they were not up to the task of doing the best that could possibly be done. I am balanced between tremendous gratitude to them that so much has been saved, and such grief at the loss. God bless everyone who worked to save this priceless building for all of us. 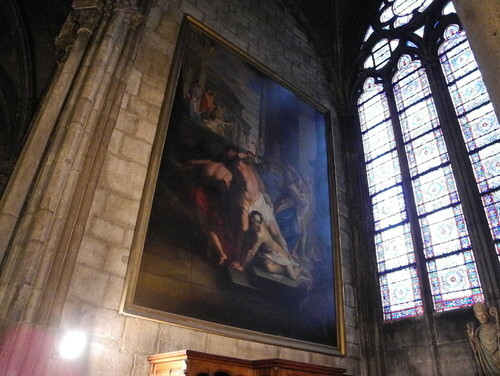 Another art historian here: I lived in Paris for a year, while studying art and history at the Sorbonne. 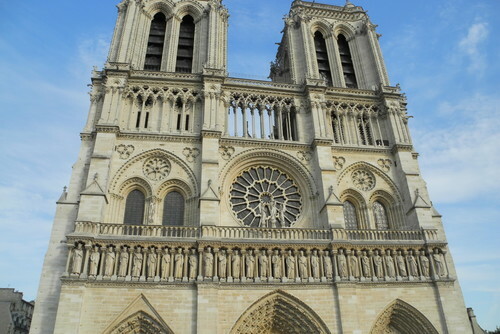 Notre Dame was one of my favorite haunts in the city. I still have the watercolors I did of the cathedral. It was heartbreaking to watch the fire unfold. The French firefighters knew what they were doing by not dropping water from the skies on the flames. The weight of the water would have increased the structural damage. 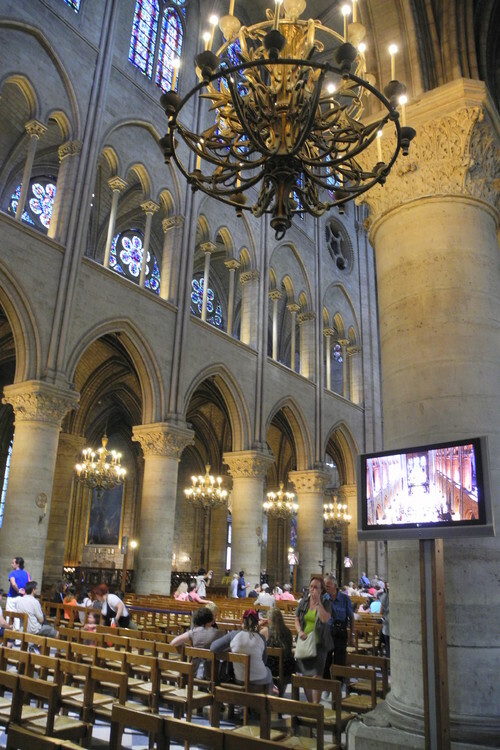 Already, two French billionaires have pledged large sums towards the rebuilding. I am thankful that the two towers are still intact. Barr scheduled to spin Mueller report tomorrow morning. Now we will see who is in charge, will President acquiesce? Trump called Jimmy Carter. Will wonders never cease!